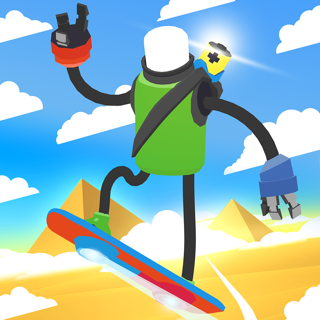 • JUMP - DASH - HIDE : Simple touch control mechanics! • Lots of handcrafted stages! • Beautiful simplistic visuals with glitch effects! Lots of different levels with moving platforms, spikes and various routes with puzzling elements will keep you busy on the level based game mode! Arcade modes gives you an extra challenge while competing against other players on the leaderboards! The idea of this game is cool. However, I think that it would be way better if the levels didn't have a pause between each part. For example, let's say level 4. You start, you pass the obstacle and then there is a black screen then you're at another obstacle. Once you pass that, another black screen to switch you to another obstacle. After every obstacle, there is a black screen to take you to another obstacle. I would constantly play if it were like Geometry Dash or Vector, where every level doesn't have a pause between every obstacle or a black screen between every obstacle. Also, a horizontal look for the game would be better instead of it being vertical. I’m trying to stick with it, and it could improve upon further updates, but it just comes off as awkward. Hard to know when the dude is gonna pop up on the screen. Whenever he does, it’s hard to control him. It’s some things that could be fixed with an update; maybe have him appear with a countdown or have some sort of something that says “tap to begin,” so we can know when to expect him to start running, if that makes sense. Interesting concept, but I think the game needs a bit more polish. For instance, it’s hard to tell when the stage starts, so you’re not sure if a gesture will be used or ignored. Also, the timing of when the character comes out is a little weird, which means you have to anticipate when to make an initial action based on no visual feedback, only timing.